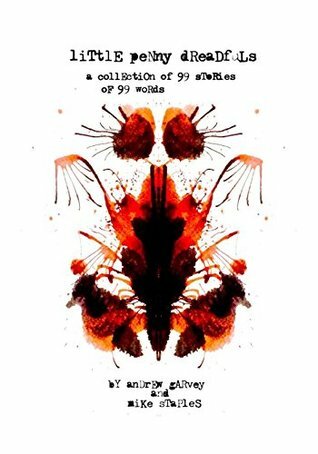 This short story collection – 99 short stories, all 99 words long – is a book for smoke breaks, short bus rides, and trips to the bathroom. Little Penny Dreadfuls accomplishes its goal with nary a hitch. Author Andrew Garvey and Mike Staples tag team these stories, alternating from one writer to the other. They weave a tight, fun read ranging from the quietly gruesome – ‘The Itch,’ about a child going to extreme lengths to cure her itchy eyes – to the bluntly hilarious – ‘New Friends,’ a chuckler about a talking zombie – to the ridiculous (will the Pope shoot up St. Petersburg?). Due to the book’s nature, you can breeze through these babies in minutes. It’s definitely part of the book’s appeal and an example of how flash fiction, an often forgotten form, can satisfy and entertain readers for a (relatively) long-haul. My main concern with Little Penny Dreadfuls is that Garvey and Staples might have limited themselves by the slightly gimmicky ‘99’ rule. There are times when it feels like the authors may have thrown in some extra adverbs to even the word count, or other instances where they could have elaborated but were unable to do so, keeping with their self-imposed limitation. I rated this novel highly, although I have to include the following caveat. Potential readers should know that many of these vignettes hit the same story beats at the same time. If you indulge too much of this book in one sitting you may tire of the ‘beat…beat…beat…TWIST!’ template that many of these shorts follow. But when consumed properly, this tiny collection makes for an effortless, entertaining read that accomplishes exactly what the authors set out to do. I’m eager to see what Garvey and Staples have in the works next.